News at Spencer Public Library: Book Giveaway During Grand Meander at Your Library! Book Giveaway During Grand Meander at Your Library! This coming Monday, December 3rd, is Spencer's Grand Meander, and the library will be participating with lots of fun activities from 6-8pm. 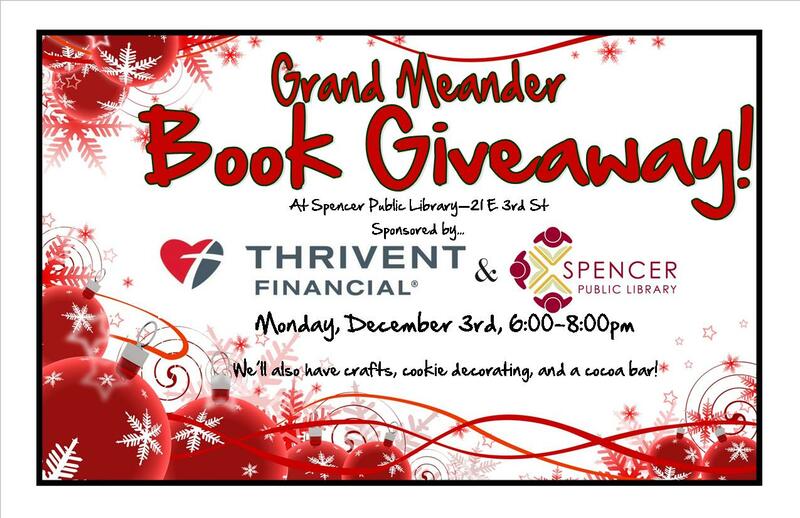 We will be giving a BOOK to EVERY CHILD who visits Monday evening thanks to a donation from Thrivent Financial. In addition to the book giveaway, everyone is invited to decorate a cookie, do a craft, play life-size Candyland, decorate a holiday card for one of our homebound patrons, and enjoy the cocoa bar! Join us for all the fun, free youth events being offered this December.